From left to right: Jimmy Kobashigawa, Nathan “Kaipo” Punahele, James “Kimo” McClellan, Kimberly Chow, Thomas Chow, Allen Couture, Kaikoa Couture, EMN2 Isaac Goodsman, and Tsarkie. 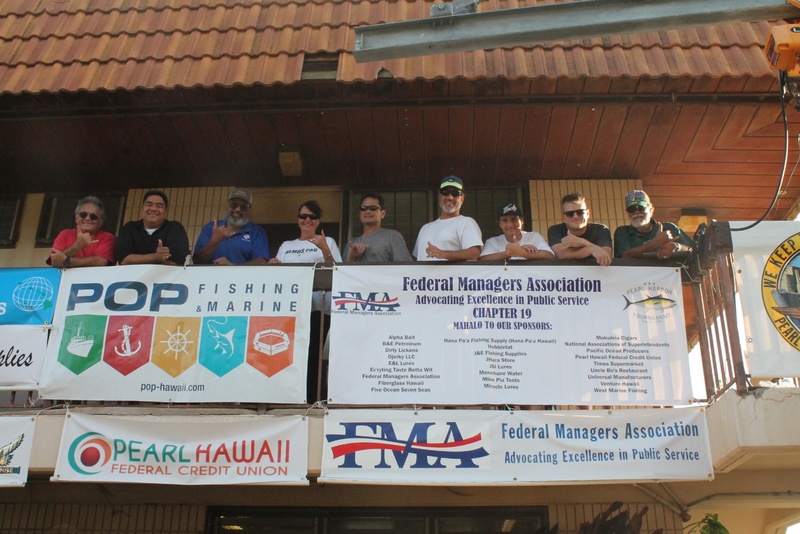 A beautiful Hawaiian day blessed the 2018 Pearl Harbor Fishing Tournament that took place on Saturday, July 14. 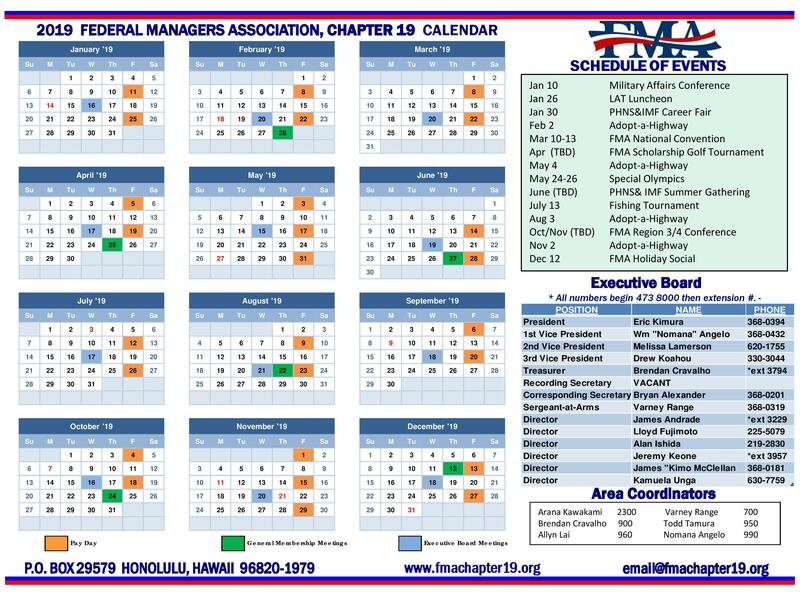 The tournament was offered in appreciation to all our hard working men and women that keep our Fleet fit to fight, to strengthen friendships within Hawaii fishing community, and to encourage sport fishing excellence. The fishing forecasts showed favorable fishing conditions for the 61 boats that launched from the Waianae Small Boat Harbor. Light easterly winds, calm seas, staple pressure, rather clear skies, and a few passing rain showers made for a good day and turned out to be an exceptional day for the crew of the LUWANA K under Captain Vernon Kim. The tournament, organized by James “Kimo” McClellan as Chairman and Thomas Chow as Co-Chairman, both from Pearl Harbor Naval Shipyard and Federal Manager’s Association Chapter 19, Director and member respectively, offered prizes to the 10 heaviest fish to make it to the line for the scales by 5:00 pm. The tournament kicked off at 3:30 am with Shipyard Commander, Captain Burton assisting with boat inspection to ensure they were getting underway without any live bait as the tournament was a deep sea trolling tournament that only permitted lures. Boats were underway prior to sunrise eager to reach their favorite fishing spot in hopes of landing the largest Au, Ahi, Mahimahi, Ono, or Aku. Each boat was required to report when they hooked up with a fish and when the fish was landed. Congratulations to team Kamakaze with Captain Ben Kahalehoe for landing the first fish of the tournament just before sunrise at 5:53 am. Throughout the day 32 of the 61 boats that entered the tournament landed fish. All tournament boats received a tournament grab bag to take home compliments of the tournament’s many sponsors. A tournament of this scale requires many volunteers and leaders however the tournament sponsors are critical to making this annual event a special and worthwhile occasion for all. A big thank you to Alpha Bait who donated custom lure heads; to B&E Petroleum who donated diesel fuel certificates; to Dirty Lickens, who donated homemade sauces; to DJerky LLC, who donated made in Hawaii, thin sliced, crispy, beef jerky; to E&L Lures who donated custom lure heads; to Ev’rything Taste Betta Wit, LLC, who donated specialized T-shirts; to Fiberglass Hawaii that provided gift certificates; to Five Ocean Seven Seas who donated lure heads; to Hana Pa’a Fishing Supply who donated gift cards; to Hobbietat, who donated fishing supplies; to J&E Fishing Supplies who donated fishing poles; to JHara Store who donated fishing supplies and gift cards; to JSI Lures who donated custom 2018 commemorative fishing tournament lure heads; to Menehune Water that donated purified drinking water; to Mike Pia Tents for donating tent, table and chair service for this tournament; to Miracle Lures who donated custom lures; to Bulley Ahi who donated a custom gaff; to Mokuleia Cigars who donated cigars; to Pacific Ocean Producers who donated gift cards; to Times Supermarket who donated lots of house hold goodies; to Uncle Bo’s Restaurant who donated gift certificates; to Universal Manufactures who donated custom stainless steel grills; to Venture Hawaii who donated custom trucker hats; to West Marine who donated fishing supplies; to Pearl Hawaii Federal Credit; to the Federal Managers Association Chapter 19; and to the National Association of Superintendents of Naval Shore Establishments. Our deepest gratitude to the sponsors who provided lots of goodies and prizes to support this annual tournament. Excitement always mounts as the boats make their way to the scale and we get our first glimpse at their catch as we hoist the fish to the scale. A special thanks to the tournament’s weigh master, EMN2 Isaac Goodsman, who expertly operated the scale and weighed all 45 fish that were consider for the prizes. In total 14 Ahi, 2 Au, 8 Ono, 3 Mahimahi, and 18 Aku were weighed. Prizes were also provided for the heaviest fish for each species. The 10th place prize was awarded to the SIX SHOOTER under Captain Bryant Lee Loy with a 113.8 pound Ahi. 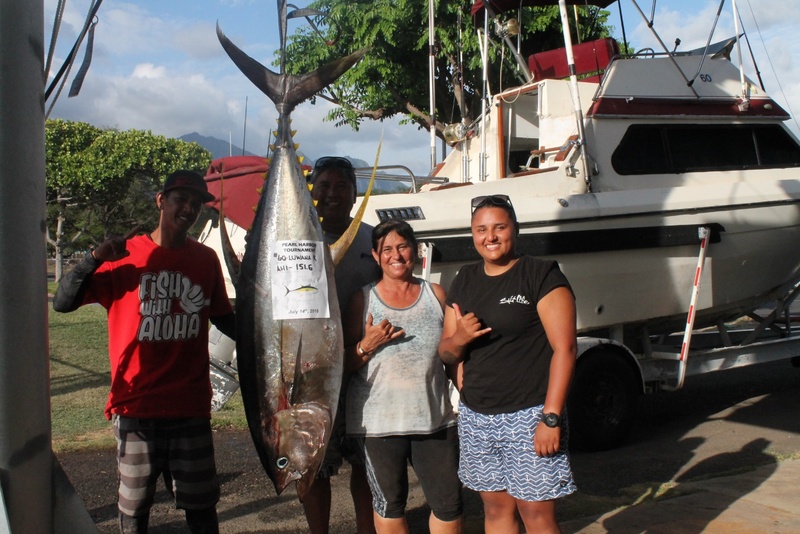 Continuing in reverse chronological order was 9th place prize to KAI LEE under Captain Greg Apo for a 114.4 pound Ahi; 8th place prize to JAYMIELYN under Captain Glenn Pestana for a 117.4 pound Au; 7th place prize to KEOLANANI under Captain Clarence Adams Jr. for a 118.0 pound Ahi; 6th place prize to SHADELLA S. II under Captain Leslie Cansibog for a 123.6 pound Au; 5th place prize to CHRISTAL BLUE under Captain TJ Morris for a 124.0 pound Ahi; 4th place prize to RITA-K under Captain Gary Kaneko for a 128.8 pound Ahi; 3rd place prize to RENA ANN under Captain Kale Smith for a 142.6 pound Ahi; and 2nd place prize to OHANA H under Captain Spencer Hisatake for a 147.0 pound Ahi. Now back to Captain Vernon Kim who was awarded the 1st place prize for the heaviest fish weighing in at 151.6 pounds and for having the largest Ahi. Captain Vernon Kim will have his name etched onto the official Pearl Harbor Fishing Tournament perpetual trophy. The trophy began in 2017 when Captain Keith Frias landed a whopping 422 pound Au to win the 2017 tournament and had his boat’s namesake etched onto the trophy. Need-less-to-say, our 2018 tournament did not yield many Au. Of the two Au that landed, the largest Au was weighed at 123.6 pounds and was landed by SHADELLA S II under Captain Leslie Cansibog, who also was awarded with the 6th place prize. The fattest Ono that was brought to the scale weighed in at 44.2 pounds and was landed by KIKUYO S under Captain Trevor Saiki. The largest Mahimahi from the tournament was landed by EMI KAI II under Captain Brian Kawano and weighed in at a plump 41.8 pounds. Of the many Aku that were weighed, the prize for the heaviest Aku was awarded to the LITTLE DINGHY under Captain Kevin Takahashi with a 27 pound Aku. 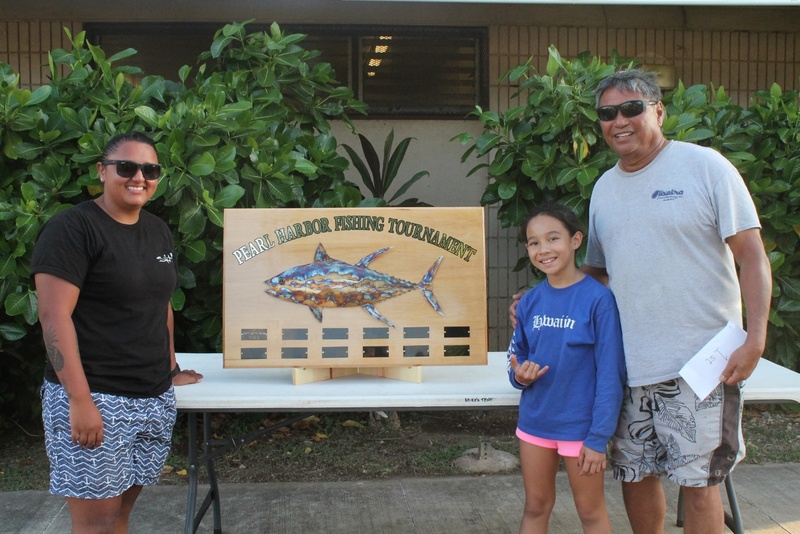 Congratulations to all our winners and much appreciation to the Waianae community and Waianae Small Boat Harbor for allowing us to host what has become one of the last fishing tournaments for the island of Oahu. We were all blessed with a beautiful day, fabulous ocean conditions, generous sponsors and another successful tournament.